"By turns heart-rending and thrilling, this big-hearted book recounts a fictionalized life of this most extraordinary of women in prose that is lush, and details that are meticulously researched. I loved this book." Fall 2011 Great Lakes Great Reads fiction pick! "Never would I allow my size to define me. Instead, I would define it." She was only two-foot eight-inches tall, but her legend reaches out to us more than a century later. As a child, Mercy Lavinia "Vinnie" Bump was encouraged to live a life hidden away from the public. Instead, she reached out to the immortal impresario P. T. Barnum, married the tiny superstar General Tom Thumb in the wedding of the century, and transformed into the world's most unexpected celebrity. Here, in Vinnie's singular and spirited voice, is her amazing adventure—from a showboat "freak" revue where she endured jeering mobs to her fateful meeting with the two men who would change her life: P. T. Barnum and Charles Stratton, AKA Tom Thumb. Their wedding would captivate the nation, preempt coverage of the Civil War, and usher them into the White House and the company of presidents and queens. But Vinnie's fame would also endanger the person she prized most: her similarly-sized sister, Minnie, a gentle soul unable to escape the glare of Vinnie's spotlight. A barnstorming novel of the Gilded Age, and of a woman's public triumphs and personal tragedies, The Autobiography of Mrs. Tom Thumb is the irresistible epic of a heroine who conquered the country with a heart as big as her dreams—and whose story will surely win over yours. There was also a mention in the Wall Street Journal, January Magazine, and Chicago Magazine! "Mercy Lavinia "Vinnie" Warren Bump, the diminutive wife of Gen. Tom Thumb, narrates her life story in this vivacious fictionalized autobiography that takes her from a small New England town to a seedy Mississippi showboat and eventually into the entourage of the impresario P.T. Barnum. ....The smart and unyieldingly ladylike Vinnie emerges as an effervescent narrator with a love of life and a grand story worth the price of admission." "This follow-up to Benjamin's Alice I Have Been is loosely based on the life of Lavinia "Vinnie" Warren Bump, who married world-famous "little person" Charles Stratton (aka Gen. Tom Thumb). Benjamin tells Vinnie's story from her upbringing in a modest but proud Massachusetts family to her early forays into show business on a seedy riverboat to her eventual fame and fortune as one of P.T. Barnum's popular attractions. In an essentially arranged marriage, she reserves her emotional intimacy for Barnum and her sister Minnie, with tragic results. VERDICT Vinnie's first-person narration grabs you from the opening pages, providing hints of the absorbing and entertaining story to come. The novel is also a delightful cavalcade of late 19th-century Americana, as you travel with Vinnie up and down the Mississippi, head westward via the expanding railroad, and hobnob with New York's rich and famous. Those interested in "behind the scenes" of show business will be equally entranced." "Benjamin...conjures up another enchanting novel based on a marginalized historical figure. 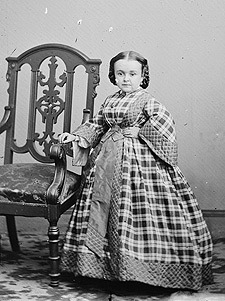 Though in her heyday the diminutive Mercy Lavinia Warren Bump, aka Mrs. Tom Thumb, was internationally renowned and celebrated, today she is primarily remembered as one of nineteenth-century showman P.T. Barnum's human curiosities. Benjamin swiftly corrects this misassumption, allowing "Vinnie" to speak for herself under the guise of penning her autobiography.... Beginning on a seedy riverboat and culminating in royal and presidential invitations, Vinnie's brilliant career as an entertainer is eclipsed only by her bittersweet personal story, as her fame exacts a tragic toll on her beloved younger—and even smaller—sister, Minnie. Expect readers everywhere to give a great big hand to the little lady." "The Autobiography of Mrs. Tom Thumb is a fascinating story of triumph and tragedy and one person who refused to live a small life. Part biography, with a healthy dollop of artistic liberty, it is a spellbinding tale from the Gilded Age that seems more relevant now than ever." "Melanie Benjamin's striking novel about the diminutive Lavinia Warren Bump, one of P.T. 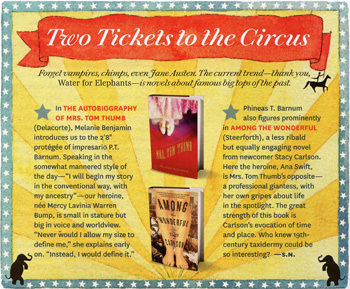 Barnum's "oddities," shows that love and desire, strength and ambition come in all sizes. Mrs. Tom Thumb brings out the humanity in all of us." "Melanie Benjamin has created a compelling heroine, whose dramatic and poignant story will capture the reader's heart to the last page." "Clever and genteel, like one would imagine a conversation with Lavinia Stratton would be, Benjamin's book is dramatic but slow-paced, interesting and old-fashioned, and at once a look at both a transitional moment in American history and a singular American story. This is a lovely novel, ambitious in its attempt to illuminate the life of a fascinating woman." 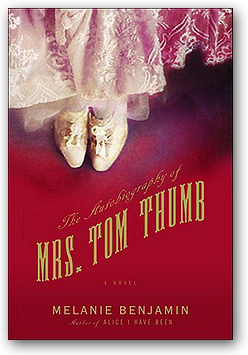 "The Autobiography of Mrs. Tom Thumb is as real as historical fiction can hope to be. Supported by what is known, it is brought to life by what is imagined. 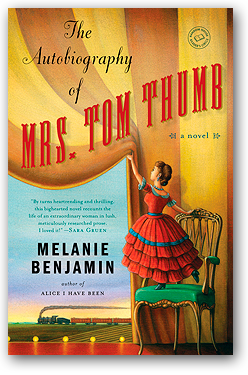 Melanie Benjamin enfolds the reader in the intimate world of Lavinia Warren Stratton, better known as Mrs. Tom Thumb, and in the greater world in which she lives....Benjamin creates Vinnie's voice and world from a continuous cloth." "Benjamin's reimagined Vinnie is a little lady, a perfectly proportioned miniature person who insists on being treated as a full-fledged human being, not a sideshow freak or a living doll. Benjamin gives her a narrative voice that is feisty, intelligent, brave, adventurous, and resourceful... But the real strength of this novel lies in the way she is able to render Vinnie, and all her major characters, fully human and sympathetic." "Benjamin, whose previous novel was Alice I Have Been, knows how to combine research and readability. And she's given Vinnie such dignity and courage... that her heroine commands attention from the first page."